Photo of adult spring run salmon in upper Butte Creek canyon in summer awaiting fall spawning. Source: California Department of Fish and Wildlife (CDFW). Butte Creek drains a portion of the mountains southwest of Mt. Lassen, on the east side of the Sacramento Valley (Figure 1). The creek’s steep canyon and falls prevent spring-run salmon from passing upstream of Quartz Bowl Pool. Spring-run spawn in about 13 miles of creek downstream of Quartz Bowl from mid-September through October. The adults arrive in the spawning area from about March through May or June. They hold in the deep pools in Butte Creek over the summer until they spawn in the fall. Fall-run salmon ascend the creek on high flow events at any time from September through December. However, CDFW intentionally blocks fall-run from migrating upstream of Parrot-Phelan Dam (location T6 in Figure 1), in order to prevent fall-run from interbreeding with spring-run and from spawning on top of redds that spring-run have already created. There is a strong positive recruit-per-spawner relationship with strong time (year) component – recruitment has increased steadily over the years with the buildup of the population. 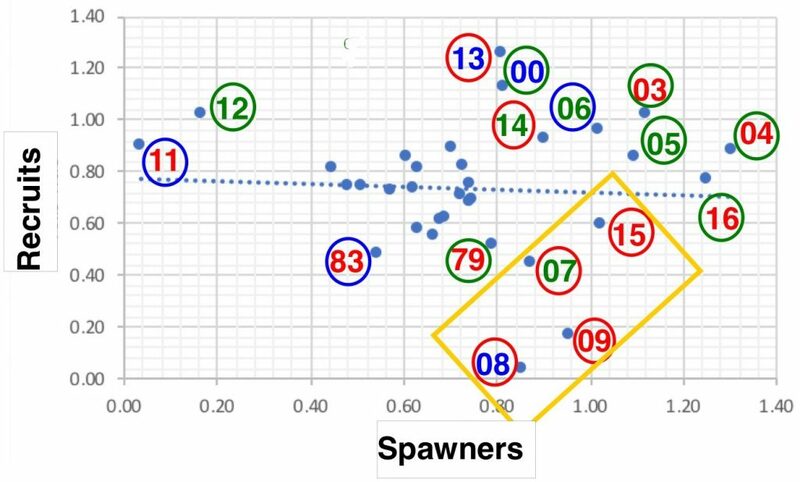 Recruitment per spawner was stronger for brood years with good conditions during critical time periods: fall spawning for their parents, winter-spring rearing and emigration, and subsequent over-summering holding conditions prior to their spawning. The initial stronger runs in the mid- to late-1980s (1986, 1988, and 1989) were jump-started with the initial stocking of Feather River hatchery smolts from 1983-1985 and optimal migration, summer holding, spawning and rearing conditions in the very wet years in the 1982-1986 period. The runs were again depressed during the extreme drought years of 1990-1992, only to recover and expand in the 1993-1999 period of wet years. Recruitment in 1984, 1985, 1999, and 2008 likely suffered from redd scouring in late fall (Nov-Dec) floods of 1981-1983, 1996, and 2005 (Figure 4). Recruitment per spawner in 2015 was poor due to drought rearing and migration conditions in winter-spring 2013, poor ocean conditions in 2014-15, and poor adult migration and over-summering conditions in 2015. In contrast, the 2016 recruitment per spawner was much higher, likely because of better adult migration and over-summer holding conditions (the drought had broken in 2016). Present management focuses on protecting over-summering adults, primarily by ensuring they have adequate cool water to sustain them until fall spawning. This is not possible without the cool water from the West Branch of the Feather River provided by the PG&E hydro project near Paradise, CA. The future of that project and the Butte Creek spring run salmon are now in limbo. Figure 1. 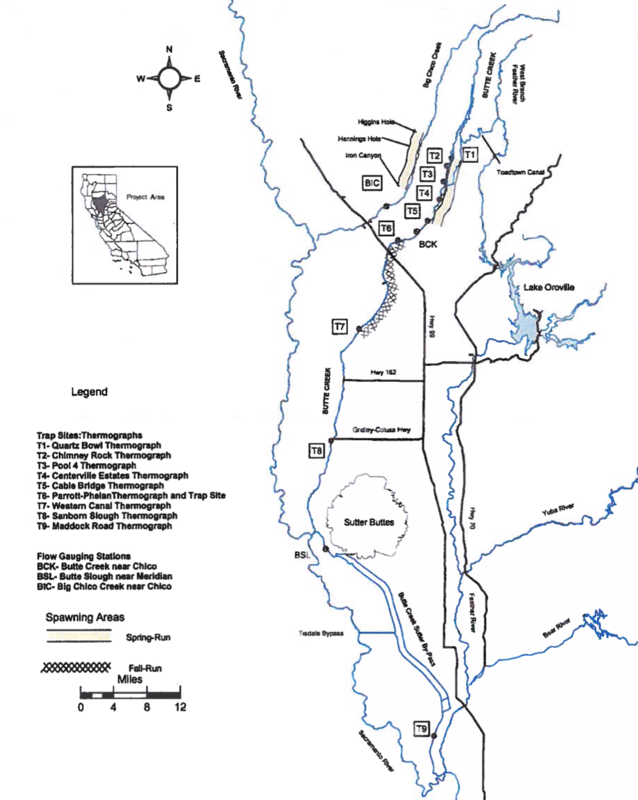 Butte Creek spawning and monitoring locations for spring-run and fall- run salmon. Spring salmon can reach as far upstream as Quartz Bowl (T1). CDFW intentionally blocks fall-run at the Parrot-Phelan Dam (T6). Juveniles emigrate from spawning grounds in Butte Creek to the Sacramento River (below T9) via Butte Slough, the Sutter Bypass canals, and various other natural and man-made channels in the Butte Sink, west of the Sutter Buttes Source: CDFW. Figure 2. 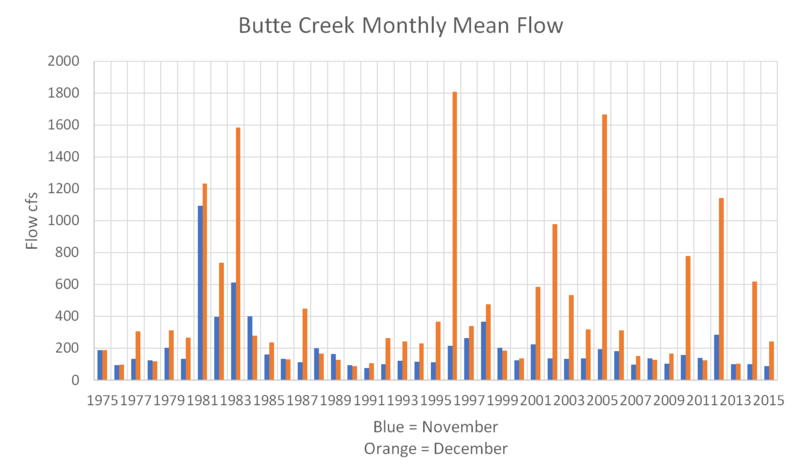 Escapement estimates (spawners) observed in the spawning reach of Butte Creek from 1975-2016. Source: CDFW GrandTab. Figure 3. Recruit-spawner relationship for Butte Creek spring-run Chinook salmon (log10 transformed). Year noted is recruit year. Color red denotes dry year rearing (year two years before). Blue denotes wet year. Green is average or normal year. Conditions encountered during spawning can also affect recruit survival. For example high pre-spawn mortality can occur that detracts from escapement estimate. Examples include 1987, 1992, 2003, 2008, and 2015. Figure 4. Mean monthly flows in Butte Creek as measured at Chico, CA. Daily flows were high – up to 4600 cfs in Nov-81 and 5000 cfs in Dec-81, and 11,000 cfs in Dec-05. How do we increase salmon runs in 2017? Over the past few months, I have written posts on the status of specific runs of salmon in rivers throughout the Central Valley. In this post, I describe the overall status of salmon runs and recommend general actions to take to increase runs as well as commercial and sport fishery harvests. The subject is timely given a poor prognosis for the 2017 salmon runs. It was just a little more than a decade ago at the beginning of the century that there were nearly one million adult salmon ascending the rivers of the Central Valley (Figure 1). At the same time, there were a million more Central Valley salmon being harvested each year in sport and commercial fisheries along the coast and in the rivers of the Central Valley. Improvements in salmon management in the decade of the 1990s by the Central Valley Project Improvement Act, CALFED, and other programs had paid off handsomely with strong runs from 1999 to 2005. New and upgraded hatcheries, combined with the implementation of trucking hatchery smolts to the Bay, significantly increased both harvest and escapement to spawning rivers. Figure 1. 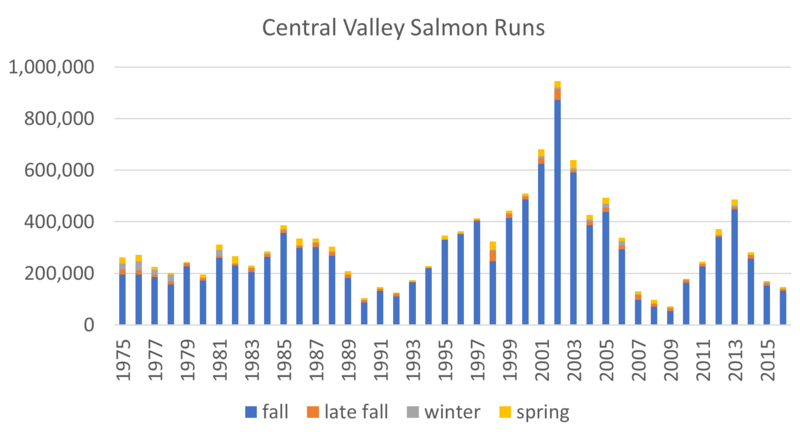 Central Valley salmon runs from 1975 to 2016 including fall, late fall, winter, and spring runs. Source of data: CDFW GrandTab. By 2008-2009 escapement had fallen by over 90% to a mere 70,000 spawners of the four major Central Valley runs of salmon. DFW and the Pacific Fishery Management Council greatly restricted fishery harvest of salmon beginning in 2008. The winter run, the most threatened of the four runs, fell from 17,296 to 827 spawners in just five years. Drier years from 2001-2005, poor ocean conditions in 2004-2005, record-high Delta water diversions, and the 2007-2009 drought were contributing factors in these declines. Impacts to coastal communities and the fishing industries were severe. Extraordinary recovery measures included closing fisheries and trucking most of the hatchery smolt production to the Bay or Delta. Federal salmon biological opinions (2009, 2011) limited winter and spring water-project exports from the Delta. The state and federal governments and others spent hundreds of millions of new dollars on habitat and fish passage improvements in the Valley to improve salmon survival and turn around the declines. Figure 1 demonstrates that these efforts were somewhat effective in limiting run declines during the 2012-2015 drought, compared to the 1987-1992 and 2007-2009 droughts. However, the prognosis for 2017 is again bleak. The consequences of the 2012-2015 drought are about to fully play out. Once again, projected runs are low and responsible fishery agencies are restricting harvest. Managers once again must take action to minimize the long term effects and help bring about recovery. Reduce harvest: Sadly but necessarily, the Pacific Fishery Management Council and west coast states took this first step: they severally restricted the 2017 harvest in the ocean and rivers. Improve spawning, rearing, and migrating conditions: Sadly, responsible agencies unnecessarily compromised on Sacramento River water temperatures in the first ten days of May, 2017 (Figure 2). 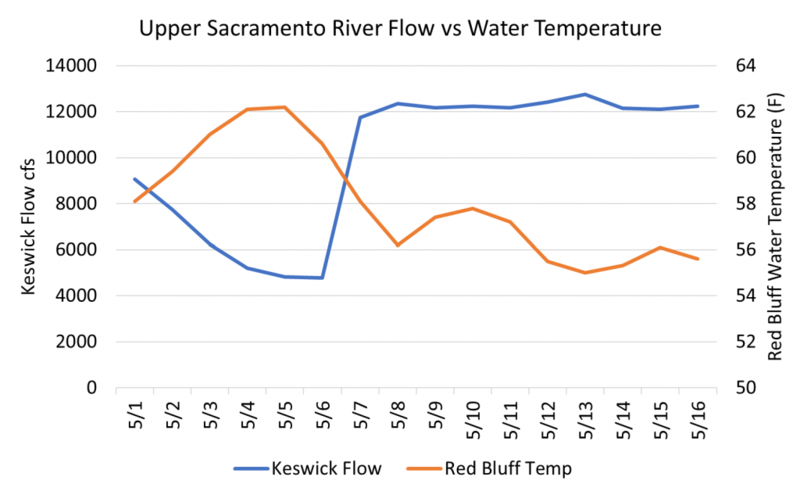 The Bureau of Reclamation released flows as low as 5000 cfs from an effectively full Shasta Reservoir, and water temperature at Red Bluff exceeded the 56oF temperature standards in the biological opinion for salmon and in the Basin Plan. The resulting high water temperatures affect salmon egg incubation, rearing, and emigration-immigration success. In one of the wettest years on record, there is no excuse for failure to meet flow and temperature targets in all Central Valley rivers and the Delta. Limit Delta exports: Delta exports this spring reached unprecedented highs not seen in recent decades, resulting in high salmon salvage rates at the Delta fish facilities (Figure 3).1 With high water supplies in this wet year, there is no need for high exports, especially if it reduces survival of salmon and other native fishes. If anything, exports should be minimal. 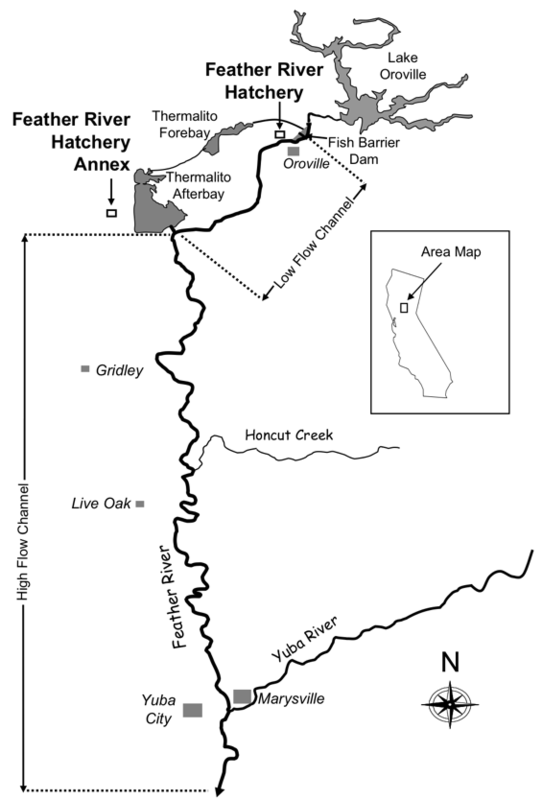 Transport hatchery smolts to Bay: the transport of millions of fall-run smolts from state hatcheries on the Feather, American, and Mokelumne rivers to the Bay provides higher rates of fishery and escapement contributions and low rates of straying. Barge transport to the Bay offers potentially lower rates of predation and straying for Federal hatcheries near Redding. Raise hatchery fry in natural habitats: recent research indicates that rearing hatchery fry in more natural habitat conditions increases growth rates, survival, and contributions to fisheries and escapement. Raising hatchery fry in rice fields is one potential approach. Restore habitats damaged by recent record high flows in salmon spawning and rearing reaches of the Central Valley rivers and floodplains: in nearly every river, flooding in 2017 has damaged habitats. These habitats now require extra-ordinary repairs and maintenance to ready them again to produce salmon. With an abundant water supply this year, take further actions to enhance flows and water temperatures to enhance salmon survival throughout the Central Valley: actions may include higher base flows, flow pulses, or simply meeting existing target flow and temperature goals. In conclusion, managers should take immediate actions to minimize the damage to salmon runs from the recent drought using this year’s abundant water supply. They should avoid efforts to exploit the abundant water for small benefits to water supply at the expense of salmon recovery and should make every effort to use the abundant water for salmon recovery. Figure 2. Upper Sacramento River flows and water temperatures in May 2017. The target water temperature for Red Bluff is 56oF. Source of data: USBR. Figure 3. 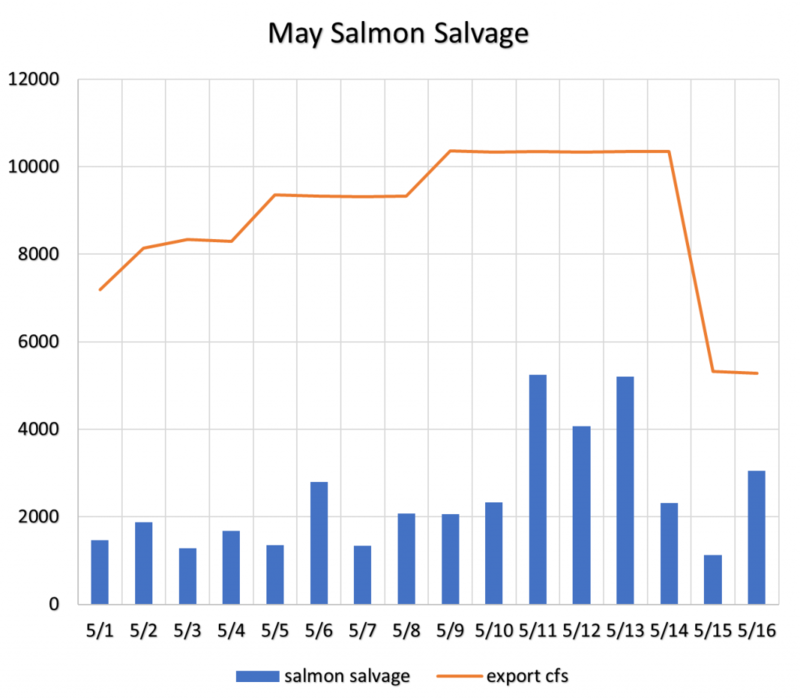 Export rate and young salmon salvage at South Delta federal and state export facilities in May 2017. The target export rate limit for May is 1500 cfs. Source of data: USBR. 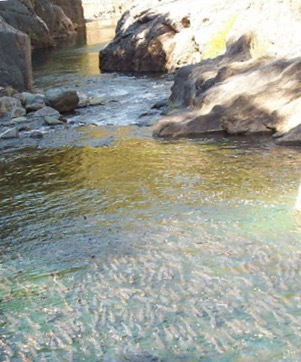 The Feather River has populations of fall-run and spring-run Chinook salmon. Both populations are heavily supplemented (up to 90%) by the Feather River Fish Hatchery near Oroville. There is some natural production in the tailwater below Oroville Dam (Figure 1). The Feather River contributes about 20-25% of the total salmon production in the Central Valley; most are fall-run Chinook. Figure 1. Lower Feather River and hatchery location. Source: CDFW. In a recent post I discussed the Sacramento River salmon populations. In this post I discuss the Feather River populations of fall-run and spring-run Chinook. In recent decades, the fall-run salmon population (returns to the hatchery plus estimates of natural production based on carcass and redd surveys) has had two peaks and one severe low (Figure 2). The peaks were 2000-2003 and 2012-2014. These peak runs were likely the product of wet conditions in brood years 1997-2000 and 2010-2012. Strong hatchery contributions were also important, especially trucking and Bay-Delta pen acclimation of transported smolts in those years. The low population years from 2007-2009 are likely the product of a combination of poor ocean conditions (2004-05), lack of pen acclimation for hatchery fish trucked to the Bay (2003-05), the 2006 winter flood, and the drought of 2007-09. Figure 2. 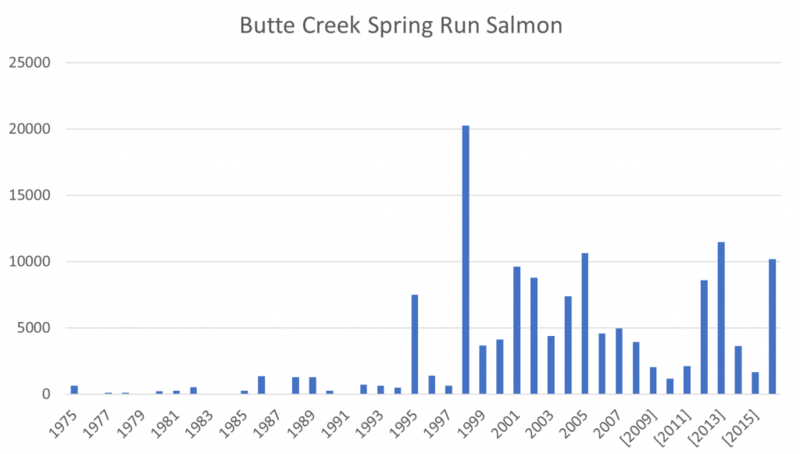 Fall run Chinook salmon escapement to the lower Feather River and hatchery 1975-2016. No in-river estimates are available for 1990, 1998, or 1999. Data source: CDFW GrandTab. Recruitment is generally depressed in dry rearing years (conditions during winter-spring two years before spawning year). Recruitment is generally depressed in dry spawning years (conditions during summer-fall spawning run). Recruitment is generally depressed for brood years subjected to poor ocean conditions (recruitment years 2007-09 and 2015-16). 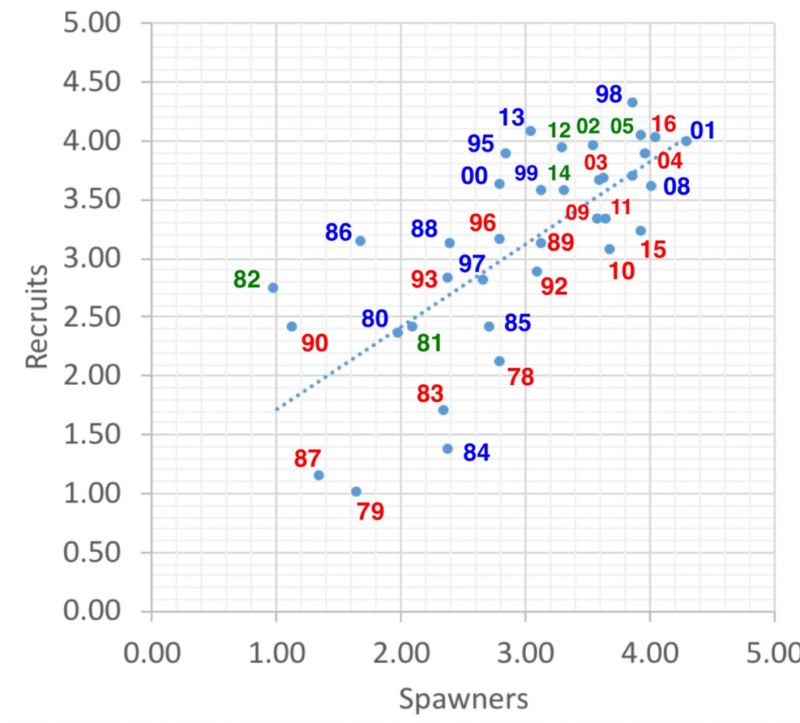 There is no apparent recruit-per-spawner relationship unless the outliers of 2011 and 2012 are removed. This lack of relationship is likely due to the strong role of the hatchery in recruitment. Efforts to improve hatchery smolt survival (i.e., higher hatchery smolt production, trucking, pen acclimation, and other actions) implemented during and after the 2008 “crash” likely helped the 2011-13 recruitment. It is likely that improved ocean conditions also increased recruitment in these same years. The December 2005 – January 2006 flood and associated rare Oroville Dam “spill” of 2006 may also have depressed recruitment in 2008. Only 1997 and 2017 had similar high spills in 1975-2017 period. 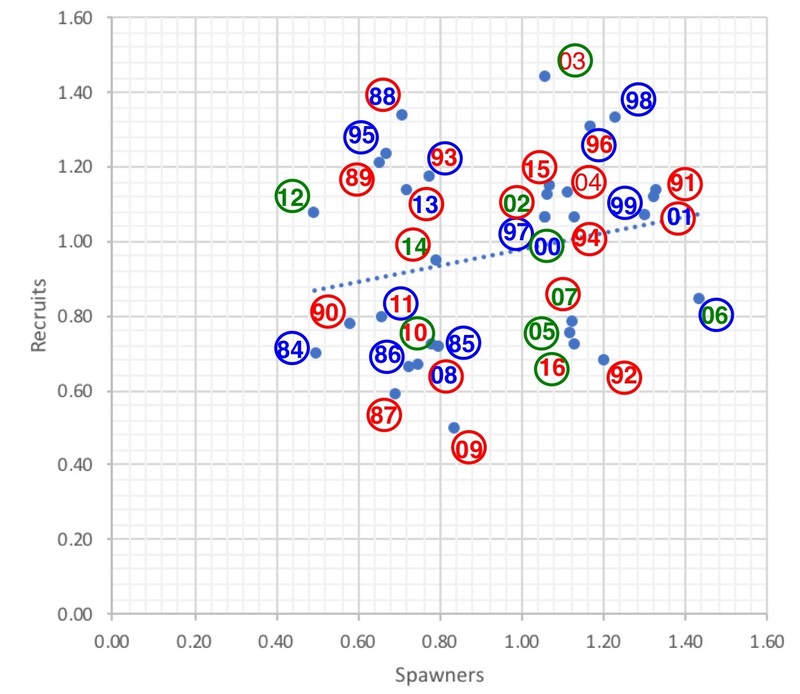 A majority of the years had a replacement rate near 1-to-1 (17 years at center of plot), likely reflecting the stability provided by the hatchery. Figure 3. 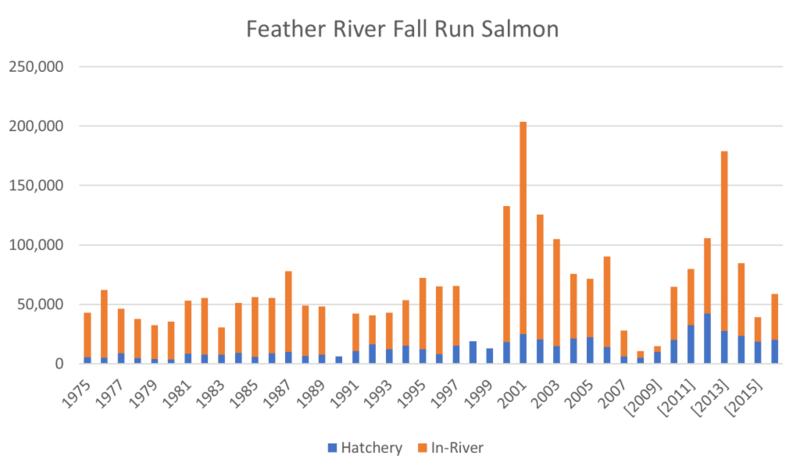 Recruitment-per-spawner relationship for Feather River fall-run salmon from 1975-2016 (log10X-4). Numbers show the years in which adult salmon returned to the Feather. The color of the number refers to hydrologic conditions two years previously, when those adults were juvenile fish rearing in the river or hatchery. The color of the circle shows the hydrologic conditions in the year the adults returned to spawn. Blue denotes a wet water year. Green denotes a normal water year. Red denotes a dry water year. Example: Adults that returned to the Feather River in 1983 reared during dry water year 1981: thus, the number is shown in red. 1983, when the salmon returned as adults to the Feather, was a wet year: thus, the circle around the number is blue. The orange rectangle represents poor ocean years. Recruit years 1990, 95, 98, 99, 01, and 02 are missing. Feather River spring-run Chinook are listed as endangered by the National Marine Fisheries Service. The Feather River spring Chinook salmon run is measured by the number taken into the hatchery (Figure 4). The main patterns indicate stronger runs after 1985-1986, 1993, 1995-1999, and 2010-2012, wetter period that led to stronger runs 2 to 4 years later. Weaker runs occurred after drier periods 1987-1992, 2001-2005, 2007-2009, and 2012-2015. Figure 4. 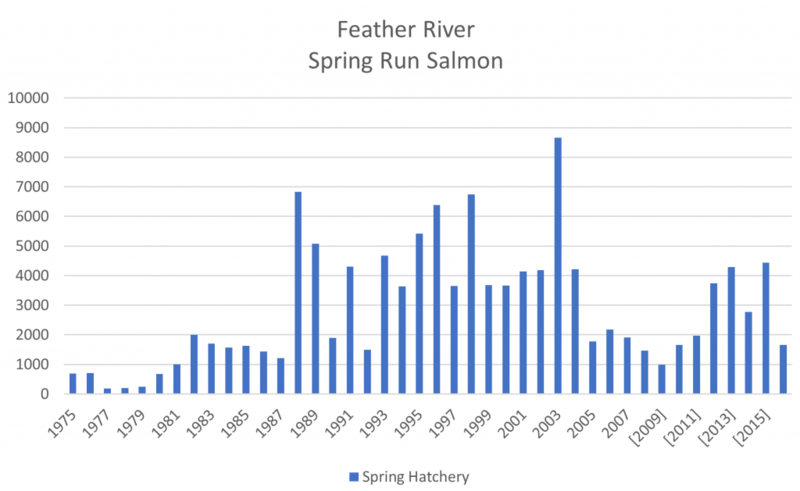 Feather River spring-run hatchery counts from 1975-2016. Source: CDFW GrandTab. Strong showings in the late 1990’s and early 2000’s were likely the consequence of trucking to and pen acclimation in the Bay. Lesser runs from 2005-2011 were likely a consequence of drier years during spawning and rearing, poor ocean conditions, and lack of trucking and pen acclimation upon release. The poor run in 2016 was in part due to the start of another period of poor ocean conditions that began in 2015. Figure 5. Recruitment-per-spawner relationship for Feather River spring-run salmon from 1975-2016 (log10X – 2.5) . Numbers show the years in which adult salmon returned to the Feather. The color of the number refers to hydrologic conditions two years previously, when those adults were juvenile fish rearing in the river or hatchery. The color of the circle shows the hydrologic conditions in the year the adults returned to spawn. Blue denoates a wet water year. Green denotes a normal water year. Red denotes a dry water year. Example: Adults that returned to the Feather River in 1983 reared during dry water year 1981; the number is shown in red. 1983, when the salmon returned as adults to the Feather, was a wet year; the circle around the number is blue. The Feather River salmon runs are an integral part of the Central Valley salmon population, and make a key contribution to commercial and sport fisheries along the coast of California. The Feather River salmon runs are predominately hatchery runs that benefit greatly from trucking to the Bay-Delta. Trucking and pen acclimation in the Bay prior to release result in good survival to and in the ocean and good returns of spawners to the Feather. Though it is counter-intuitive in a flood year, fish salvage has become a real problem this spring. 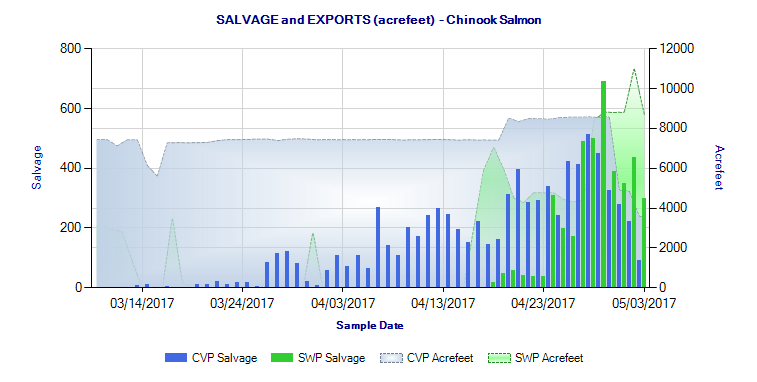 Total Delta exports reached 8,000 cfs in the first week in May, and salvage of salmon and splittail increased sharply (Figures 1 and 2). Normally, Delta standards limit export limits to1500 cfs in April-May in order to protect fish. However, higher exports are allowed when San Joaquin River inflows to the Delta are high. Even higher exports than the present 8,000 cfs are allowed, but the infrastructure cannot accommodate further exports in this wet year (demands are low and reservoirs south of the Delta are nearly full). Figure 1. Salvage of Chinook salmon at south Delta pumping plants in spring 2017. Source: CDFW. Figure 2. Salvage of splittail at south Delta pumping plants in spring 2017. Source: CDFW. In past wet years, there were restrictions on south Delta exports in April and May to protect juvenile salmon, steelhead, splittail, and smelt that were rearing or passing through the Delta. These restrictions also protected adult and juvenile sturgeon. 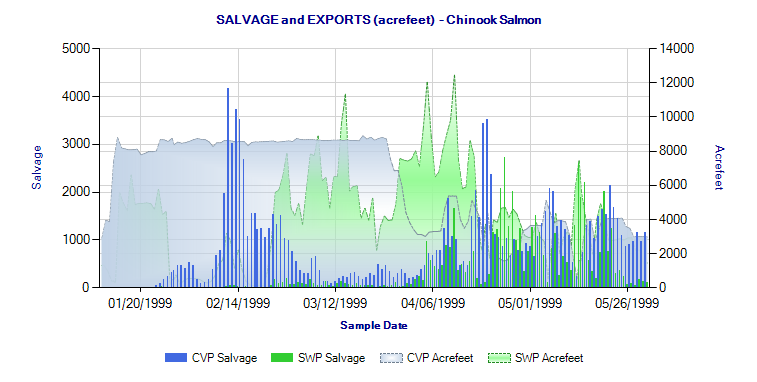 Figure 3 shows an example of Chinook salmon salvage in 1999. 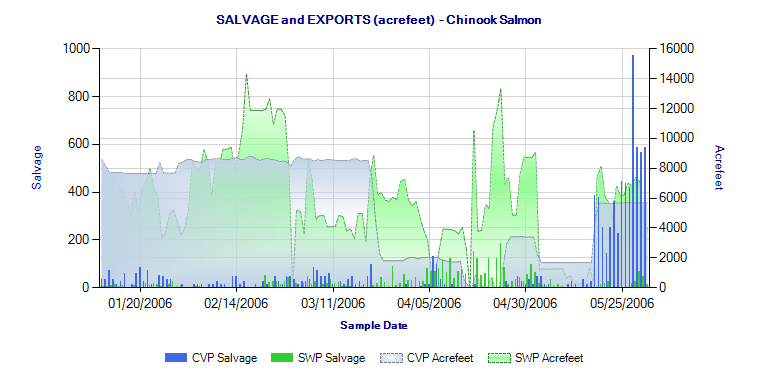 The initial peak in February 1999 salvage was salvage of fry (1-2 inches). The spring peaks were hatchery and river-reared smolts, primarily from San Joaquin River tributaries. Both exports and salvage dropped after April 15. 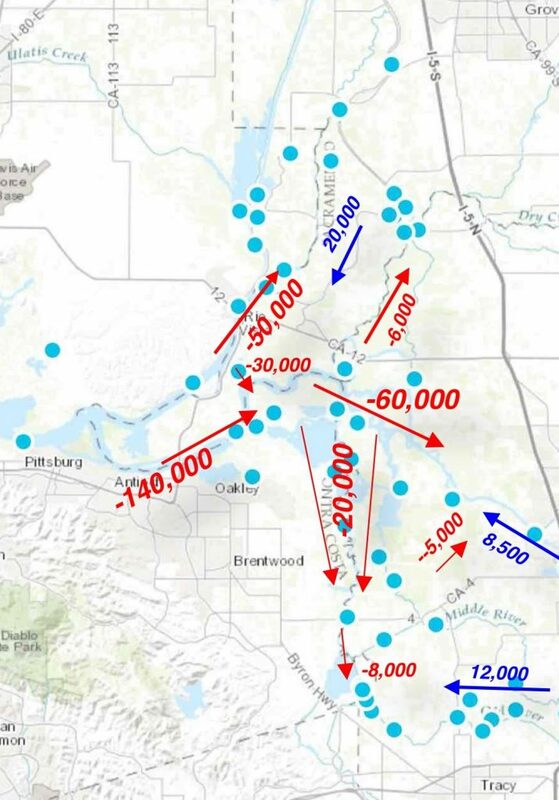 In 2017, with the diversion of over half the San Joaquin River’s flow into the south Delta through the Head of Old River and other channels (Figure 4), there is a definite risk that high export levels will draw young salmon and splittail from the San Joaquin into the south Delta. Once in the south Delta, they are subject to 8,000 cfs of diversions and a mix of tidal flows. The risk is even higher than it might seem, because the reported State Water Project diversion is a daily average. Water enters Clifton Court Forebay for only about one third of the hours in each day, during incoming tides. The reported 5000 cfs is actually more like 15,000 cfs operating for those eight hours, adding to the pull toward the pumps of the incoming tides. Reported salvage is just the tip of the iceberg, because predators eat up to 90% of juvenile salmon that enter the Forebay before these juveniles ever reach the salvage facilities. In conclusion, the State Water Board needs to change the Delta standard. It needs to limit spring exports even when San Joaquin flows are high. 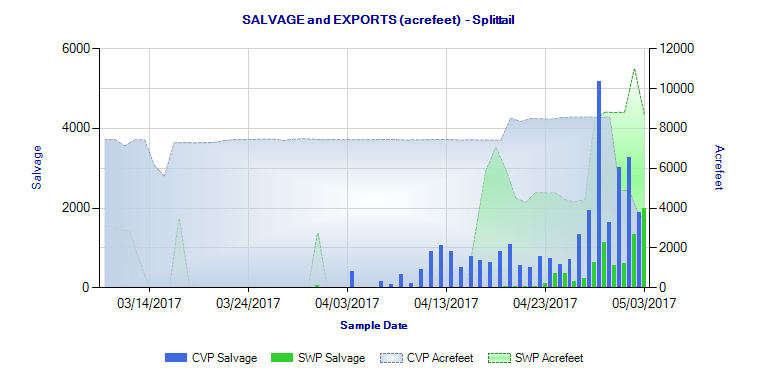 In 2006 (Figure 5), the now-defunct Vernalis Adaptive Management Program limited April through mid-May exports despite high San Joaquin flows. Salvage was markedly low during this period of limited exports. If exports continue high through May and June in 2017, there will be detrimental effects on San Joaquin salmon, steelhead, and splittail, as well as on Delta smelt. Figure 3. Salvage of Chinook salmon at south Delta pumping plants in winter-spring 1999. Note reduction in exports after mid-April. Source: CDFW. Figure 4. High tide flows in the Delta at the beginning of May 2017. Blue represents positive downstream flows during high tides, where tides had minimal influence. Red denotes upstream tidal flow during incoming tides. Figure 5. Salvage of Chinook salmon at south Delta pumping plants in winter-spring 2006. Note reduction in exports in early April. Winter-spring San Joaquin flows in 2006 were similar to those in 2017. Source: CDFW. In an April 10, 2017 post, I described a sharp decline in the Klamath River salmon runs after the 2012-2015 drought. In that post, I also noted the high relative contribution of the Shasta River run to the overall Klamath run, especially in the past six years. The recent upturn in the Shasta River run and its greater contribution to the overall Klamath run is likely a consequence of efforts by the Nature Conservancy and others to restore the Big Springs Complex of the upper river near Weed, Ca. The Shasta run has increased measurably since 2010 (Figure 1). Cattle were excluded from Big Springs Creek in 2009, and flows, water temperature and juvenile Chinook densities were markedly improved in and below Big Springs Creek.1 The improved juvenile salmon production likely contributed to greater runs from 2011-2015 and to a higher than expected 2016 run given the 2013-2014 drought (Figure 2). The improvement in the Shasta run bodes well for the Shasta and Klamath runs (Figures 3 and 4). The Shasta run recovery is key to sustaining and restoring the Klamath run and coastal Oregon and California fisheries that depend on the Klamath’s contribution. The Shasta River’s spring-fed water supply comes from the Mt. Shasta volcanic complex. This water supply is resilient to drought and climate-change. The reliability of the Shasta River’s water supply makes the Shasta River’s contribution to Klamath salmon runs particularly important. Restoration of the Shasta River and recovery of its salmon and steelhead populations has only just begun. Further improvements to the Big Springs Complex, especially to its spring-fed water supply (Figure 5) and to its spawning and rearing habitat, are planned. There is also much potential to improve habitat above the outlet of Big Springs Creek, both in the Shasta River and Parks Creek. There is further potential for habitat restoration in downstream tributaries (e.g., Yreka Creek and Little Shasta River). Reconnection of the upper Shasta River above Dwinnell Reservoir to the lower river would restore many miles of historic salmon and steelhead producing habitat.2 These improvements could make it is possible for the Shasta River to once again produce over half the “wild” (non-hatchery) salmon of the Klamath River. Figure 1. 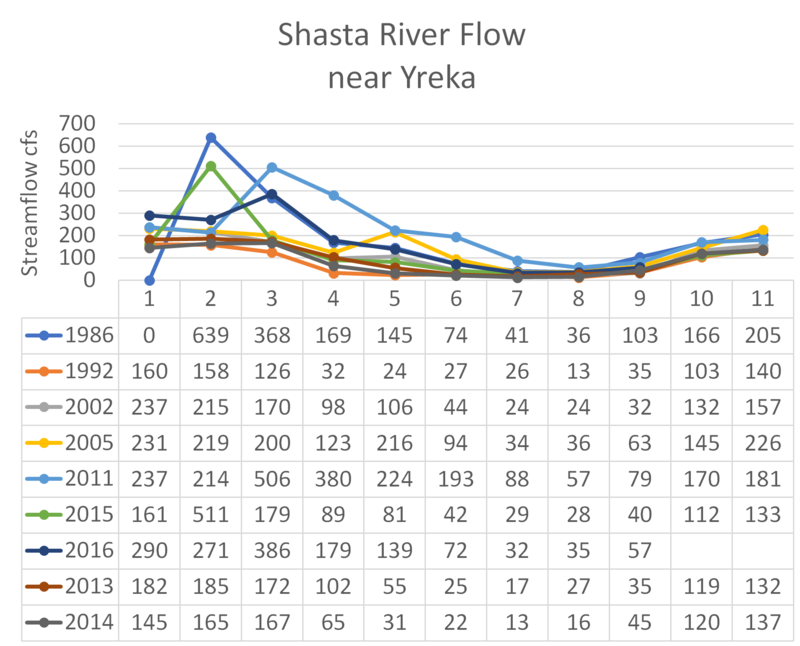 Fall-run Chinook salmon escapement (spawning run) estimates for the Shasta River from 1978 to 2016. Data Source: CDFW GrandTab. Figure 2. 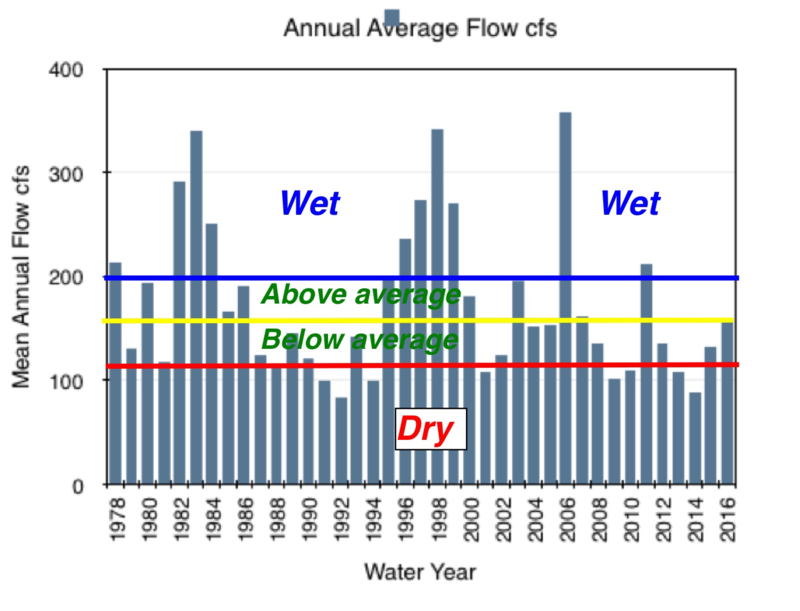 Mean annual Shasta River streamflow (cfs) as measured at Yreka, CA. Source: USGS. Designated water-year types in this figure are the author’s estimates. Figure 3. 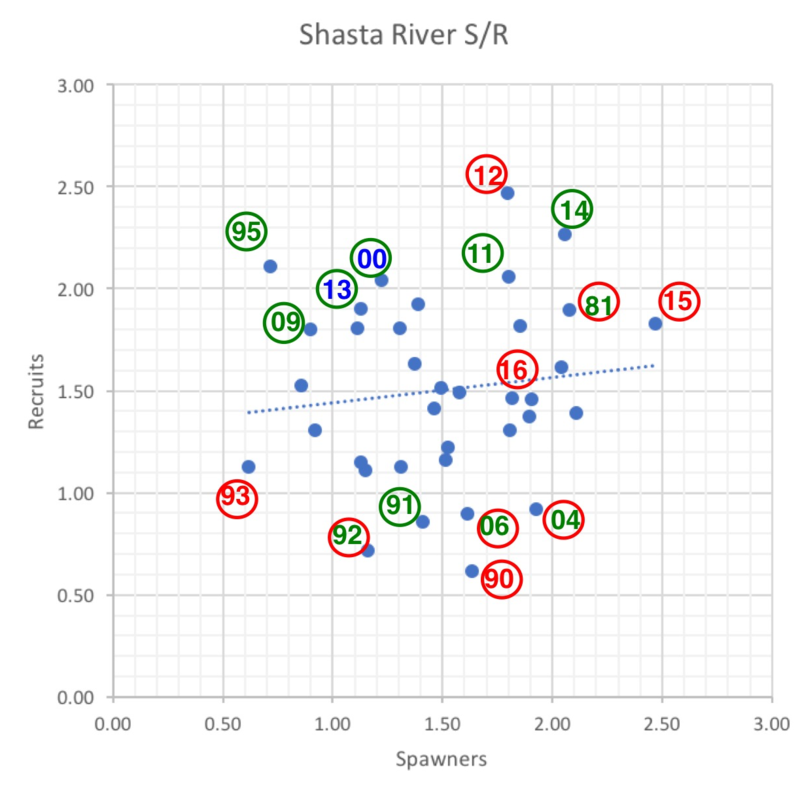 Spawner-recruit relationship for Shasta River. Escapement estimates (log10X – 2 transformed) are plotted for recruits by escapement (spawners) three years earlier. Year shown is recruit (escapement) year. The number is the year that fish returned to the Shasta River to spawn. The color of the number depicts the water-year type in the Shasta River during the year the recruits reared. The color of the circle depicts the water-year type in the Klamath River during the year the recruits reared. Blue is for Wet water-year types. Green is for Normal water-year types. Red is for Dry water-year types. Example: 90 depicts fish that returned to the Shasta River as adult spawners in 1990. These fish were spawned in 1987 and reared in winter-spring 1988. 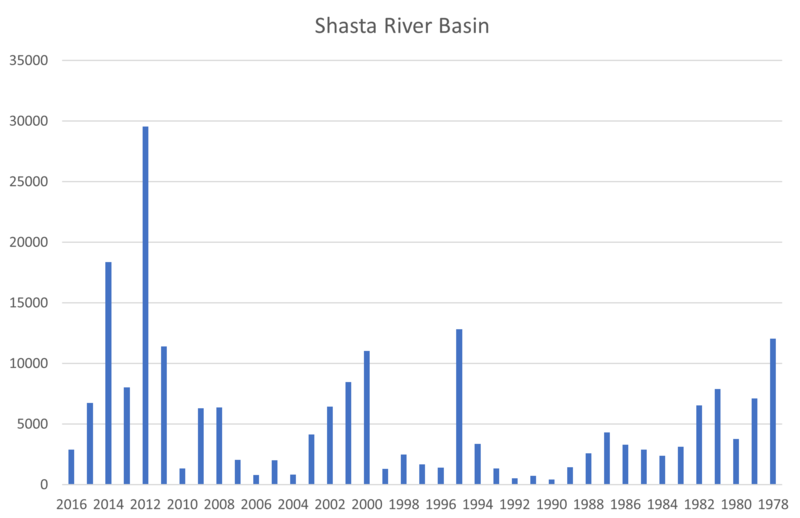 The red number shows that the 1988 rearing year was a Dry water year in the Shasta River; the red circle shows that the 1988 rearing year was a Dry water year in the Klamath River. Note very poor recruits per spawner in 1990-1993 drought period, compared with relatively high recruits per spawner from 2011-2016, even though the latter period included the 2012-2015 drought. Figure 4. 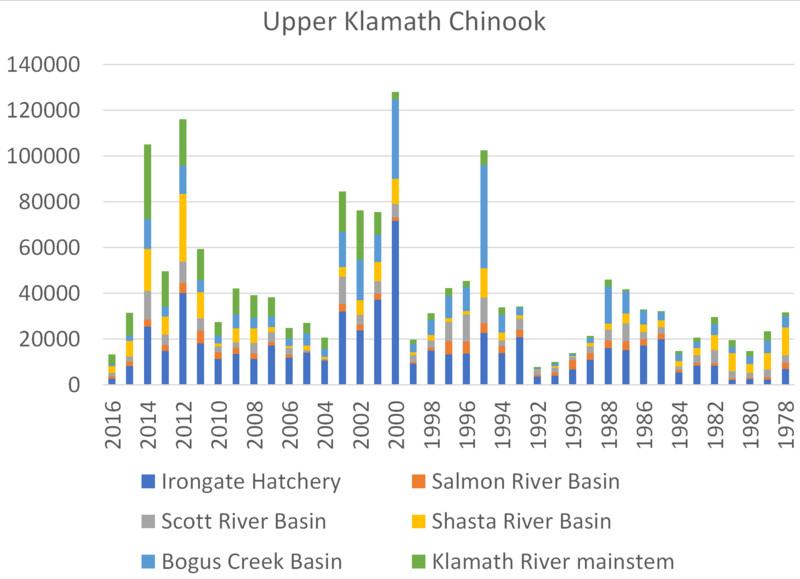 Estimates of fall-run Chinook salmon escapement for the Klamath River, 1978-2016. Data Source: CDFW GrandTab. Figure 5. Examples of Shasta River monthly average flows as measured at the lower end of Shasta Valley. Streamflow is low from late spring through summer because of surface and groundwater irrigation demands. October flows are higher because the irrigation season (and season of diversion under some water rights) ends on September 30. Data source: USGS Yreka gage.